Estimation of the project cost for a green field steel project is essential for ensuring that the available resources for the project are used effectively and wisely. The basic requirements of the project cost estimates are that these estimates are to be prepared on an ‘unlikely to be exceeded but not excessively conservative’ basis for various stages of the project life cycle to provide confidence in project priority, affordability and strategic fit. An accurate estimate goes a long way toward supporting a successful project. Quality cost estimates are also necessary in maintaining stakeholders’ confidence and trust throughout the life of the project. Hence, cost estimates are to reflect an overall accuracy which is indicative of the level of information available at the time the estimates are being developed. Cost increases over and above project budget are a constant concern of the stakeholders and the senior management. Reliable cost estimates are necessary for responsible financial management at every stage of the project. Unreliable cost estimates cause significant problems during the project implementation. Unreliable cost estimates can also lead to staffing and budgeting decisions which can result into incorrect and inefficient use of the available resources. The ‘project cost estimate’, as used during the project development process, includes all capital outlay costs, including right-of-way, structures and landscaping. Project cost estimates are never to be artificially reduced to stay within the funding limits, nor they are to be reduced for the purpose of making the funds available for the project. Likewise, project cost estimates are not to be artificially raised beyond the contingency percentages necessary for the project unless the increase is adequately justified. Project cost estimates are prepared for a planned project implementation schedule. Any delay in the project commissioning due to different reasons has an adverse impact on the project costs. Since the implementation of a steel project takes a very long time, very accurate estimation of the project cost is a difficult task since there are a large number of variables which can change with time during the implementation of the project. During the long period of implementation of the project, there is likelihood of changes in the investment environment as well as changes of the selected technological concepts taking place during the implementation time. Such changes affect the project cost adversely. Usually the project cost estimates are prepared using a consistent and comprehensive methodology. Careful attention is needed to ensure a quality estimate. The person estimating the cost needs to research costs, compare costs, and use professional judgment to prepare a quality cost estimate. Consideration of project scope, schedule, and level of design details is required to develop accurate cost estimates. Further, the project cost estimate, in a sense, is never completed. It is required to be reviewed continually to keep it current. A green field steel project needs a very long period from the time concepts of the projects are finalized to its commissioning and handing over. 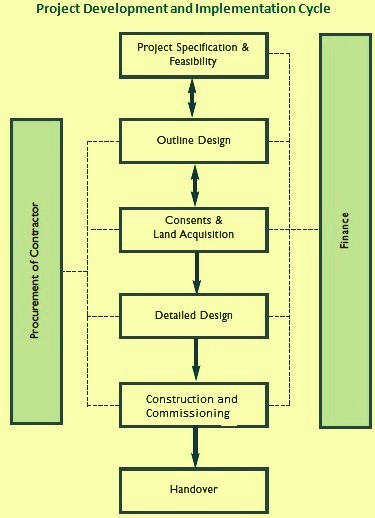 The project development and implementation cycle in brief is shown in Fig 1. Estimation of the project cost for a green field steel project is the art and science of using historical data, personal expertise and experience, institutional memory, and the project scope statement. When the project is conceived, the estimate is extremely inaccurate since very little information is available about the expected deliverables, the project team, and the project environment. But, as the project evolves and more information becomes available, the estimate is fine-tuned to a higher level of precision. The initial cost estimates of the project form the baseline budget for measuring the cost performance of the project during the implementation stage. This cost estimates, and therefore the budget, are initially very rough and inaccurate. If the budget is established during the early stages of project planning, the budget development process is to allow some modification flexibility, primarily because early estimates are inaccurate. Project cost estimation has four main stages of development. These are (i) concept development and feasibility stage, (ii) freezing of the technologies and basic engineering stage, (iii) ordering of plant and equipment and detailed engineering stage, and (iv) construction and commissioning stage. Accuracy of the cost estimates improves after completion of each stage since the levels of uncertainties comes down. With each stage getting completed, the provision for contingencies also comes down. Project cost estimates change over time for a variety of reasons, not all of which are desirable. Adjustments to estimates are usually caused by changes to scope and assumptions, pricing adjustments, contingencies, escalations and so on. No two steel projects have the same cost needed for their commissioning, no matter how similar they are. Apart from basic technical factors, the wide range of economic and institutional conditions existing in the place of the project site also affects the project cost and leads to its variations. The project cost depends on a number of factors, major amongst them are described below. Location of land – Steel project in remote place with no infrastructure increases the costs of transport of plant, equipment and materials needed for the steel project construction. It also results into increase in the costs of enabling works. Location of land also determines the cost of development of infrastructure such as water, power, road connectivity, and rail connectivity etc. Further climate of the place where land is located can have bearing on the implementation schedule and hence it affects the project cost. Type of land – Type of land has a major effect on the project cost since it affects the cost of land preparation (such as leveling of the land etc. ), as well as the cost of civil works. The soil and drainage conditions at the plant site determine the amount of excavation, piling and foundation activities needed. Further the type of land affects the plant layout and the land utilization ratio. Higher is the land utilization ratio, lower is the project cost. Problem related to land acquisition – Many times people whose lands have been acquired for the project are not satisfied with the compensation package. They may also have aspirations for getting a job in the project in lieu of their displacement from the land. Such unsatisfied people create several problems during the project implementation. 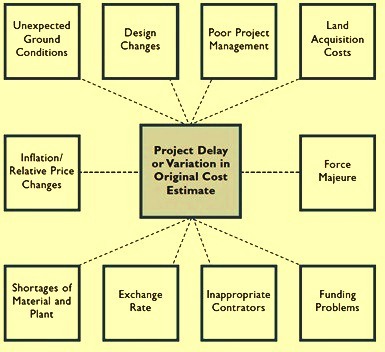 These problems result into the delays in the project with implication on the project cost. Scope – Scope of the work has the greatest influence on the project cost. For example, certain facilities (such as power plant, air separation plant etc.) are within the scope of steel project or whether they have been off-loaded to other agencies on build- own-operate (BOO) basis. Also whether the development of infrastructure for the steel project is in the scope of steel project or it is being developed by local government or other agencies. Scope also determines the nature of the raw materials planned to be procured for the steel plant. If the raw materials to be procured are not in fully processed condition then the facilities for processing need to be created within the plant boundary. Capacity – Higher capacity steel project has lower specific project cost as compared to lower capacity steel project because of economy of scale. Further, steel project with multiple units of smaller capacities has higher specific costs compared with the steel project which has higher capacity units. Technology – The technology adopted in the steel project has a major bearing on the project cost. Steel project with blast furnace-basic oxygen furnace (BF-BOF) route of steel production has different cost than the direct reduction process- electric arc furnace / induction furnace route of production. Automation level – Automation level of the plant affect the project cost. Higher is the automation level, higher is the project cost. Product and product mix – The products and product mix of the steel plant has a big influence the product cost. The product of the plant decides the type of rolling mills to be installed. Also, the finishing stage of the saleable product (semi-finished, hot rolled, cold rolled, and coated such as galvanized, tinned etc.) has influence on the project cost. Waste handling facilities – Waste handling facilities of the steel plant influences its cost. Steel plant which processes the wastes within the plant for their recycling have higher project cost compared with the plant which either dumps the wastes or gets it processed through outside agencies. Workshop facility for equipment maintenance – Steel project cost is influenced by the extent of the workshop facilities to be installed in the project. Steel plant which plans to procure the spares from outside resources has lower project cost as compared with the steel plant which plans to manufacture most of the spares itself. Laboratory facility – Steel plant which sets up minimum testing facility for meeting the product certification requirements as well process control have lower project cost compared with the plant which also sets up facilities for quality control at various stages of production and some facilities for limited research and development. Internal transport – Distribution of internal transport between rail and road and the types (concrete, black top, or unpaved etc.) and the width of the roads being planned influence the cost of steel project. Implementation method – The method of implementation of the steel project greatly influence its project costs. The project can be implemented by following different type of contracting methods. These methods include EP (engineering and procurement), EPC (engineering, procurement and construction), EPCC (engineering, procurement, construction and commissioning), EPIC (engineering, procurement, installation and commissioning), EPCM (engineering, procurement, construction and management) etc. The method of implementation adapted by the project authority has a bearing on the project cost. If the works are carried out departmentally then the project cost is different than the project work carried out by offloading the activity to the outside party. Further award of the work in small packages against total work awarded on turnkey basis has influence on the project cost. Time of implementation – Generally, the longer a project takes, the greater is the project cost. Project timescales are dependent on several factors. Usually, the higher the capacity of a steel project, the longer is the implementation time. This is not the case always. If substantial additional resources are used, project implementation can often be accelerated. Project management – The role of the proper project management is probably the most important element in containing the cost of a project. It is often true that a poor project with a good project management gets completed satisfactorily. But even a good project, if combined with poor project management, faces almost serious difficulties. A poor project management has an impact at all stages of the project implementation. The essential elements of good project management are (i) cost control, (ii) time control, (iii) quality control, and (iv) change control. Change control is very important for the project management and it must ensures that any changes which are necessary are achieved within the approved budget and they represent good value for money and have the necessary authorization to proceed. Tax liability – Normally tax rates on imported equipments are different than those equipments procured from indigenous sources. Hence any change in the mix of imported and indigenous equipment has impact on the cost estimates. Inflation – The longer the expected construction period, the higher is the necessity to take into account the expected inflationary price increases over time. Initial cost estimates undergo change due to the inflation. Level of inflation varies from year to year since it is dependent on the state fiscal policies. Shortages of materials as well as plant and equipment – During the project implementation, there are periods when there may be shortage of the construction materials or there may be delay in the receipt of equipment. These delays cause extension of the time schedule of construction and hence variations in the cost estimate. Such shortages cannot be normally foreseen during the preparation of the cost estimate of the steel project. Exchange rates – The exchange rate is particularly relevant when there is a component of imported plant and equipment in the project cost estimate. If exchange rate changes beyond the level which has been taken during the preparation of the project estimate then the cost of the project changes. Inappropriate supplier or contractor – Often project authorities placed orders on inappropriate suppliers or contractors due to reasons which are many times beyond their control. These inappropriate suppliers or contactors normally fail to fulfill their commitments and hence delay the project which has a bearing on the cost estimate. Funding issues – In case there is lack of funds availability to complete the project, then the payments to the suppliers or contractors are delayed. Due to the delays, suppliers and contractors commit lesser resources to the project or may even cease work if cash flow becomes a problem. These cause delays in the project implementation and hence have bearing on the project cost. Force Majeure – This term covers a range of events which are also commonly referred to as ‘Acts of God’. The term includes revolution, war, riot, extreme weather, earthquake, fire, landslip, and political and economic instability. Whenever these events occur, they normally lead to significant delays which have consequences on the project cost. In addition to all the factors listed above, experience shows that problems also arise from premeditated under-estimation of initial cost simply in order to obtain initial approval for a project. This can lead to the steel project getting approved and started. However, at the same time it is to be understood that actual cost of the project is going to be very much higher than the approved estimate. Once started, a high profile steel project is often politically difficult to stop. So, when the true cost become apparent, it is difficult for authorities to refuse the additional funding required to complete the project. But the revised approvals may be time taking and in the process delays the project implementation which in turn affects the project cost. Some of the factors which cause variations in the original cost estimates of the steel project are given in Fig 2. The project cost is comprised of several components. Major amongst them are given below. Land – A steel project need large area of land. Acquisition of such large area not only need a long time but also need a lot of funds. The cost of land preparation is included in this cost. The cost of land and land preparation varies from place to place and it is quite substantial. Consents and approvals – Before construction work can start for a steel project, it is necessary that various consents, approvals and authorizations are in place. The time taken to obtain these consents, approvals and authorizations is probably the most unpredictable element. This can have a significant effect on the timetable and the project cost. In case of environment clearance, environment impact analysis is necessary is to be carried out which is not only time taking but also costly since public consultation is a major element of the consent process. Inadequate allowance for required consultation can lead to unforeseen delays in project implementation. Design and engineering – Design and engineering activity is a continuous process in a steel project. It starts with the feasibility report and is carried forward till commissioning in various forms. The last activity in engineering is the preparation of as built drawings. Maximum engineering load comes during the stages of basic engineering and detailed engineering. Design and engineering costs are substantial costs in a steel project. Enabling costs – It includes costs of providing those facilities at site which are required during construction stage of the plant. Enabling facilities during the construction of the project include power, water, storages, roads and rail tracks needed for construction, office buildings, construction workshop, and housing and welfare facilities etc. for project employees etc. Civil works – Civil works in a steel project include boundary wall, foundations for buildings and equipment, roads and rail tracks, flyovers and culverts, plant drainage system, and civil buildings etc. Civil costs are influenced by the type of soil available at the plant location. Building and structural work – A steel project has several buildings for housing plant and equipment. These buildings are normally made of steel structures. Costs of these structures are reflected under this heading. Cost of technological structures which are needed for plant and equipment are not included in this cost. Cost of structural work is influenced by several factors which include height of the building, number of operating platforms, column spacing, type of ventilation needed, and capacities and speeds of overhead travelling cranes etc. Cost of fabrication and erection of building structures is included in this cost. Plant and equipment cost – This is the largest component of the project cost and include all types of technological, mechanical, process, electrical, instrumentation, automation, handling, testing, transport, and workshop equipments. This cost also include technological structures, furnaces and their refractory lining, change parts (like rolls, guides, shearing blades, and hammers for crushers etc. ), weighing equipment, equipment for pump houses, ventilation plants, cables, pipes, valves and fittings and all other types of equipments needed for making the plant complete. This cost also includes design cost of the equipment as well as their procurement cost. Erection and commissioning cost of the plant and equipment is also included in this cost. Cost of commissioning spares as well as cost of consumables and utilities required during commissioning is included in this cost. Cost of training of the employees for operation and maintenance of equipment is also included in this cost. Administration during construction (ADC) – During the planning, design and the construction stages of the steel project, a project organization is necessary which carries out the activities related to the project. This set up requires expenditure to be made. The organizational expenditure is part of the project cost which is made till the project is handed over to operating set up and the project cost is capitalized. Longer project period means higher expenditure on ADC. Interest during construction (IDC) – A large amount of funds is needed during the implementation of the steel project. A major portion of these funds are borrowed from the funding institutions. Interest is required to be paid on these funds to the funding agencies during the project stage of the steel project. The amount of interest paid till the project is handed over to operating set up and capitalization of the project cost is done is part of the project cost. Longer project period means higher expenditure on IDC. Further during the commissioning phase of the project, raw materials, operating parts, fuel and utilities, operating consumables, organizational operational set up is needed for which expenditure to be made. The funds needed for this expenditure is mostly borrowed from the funding agencies and is known as working capital. Interest paid on working capital till the project is handed over to operating set up and capitalization of the project cost is dine is part of the IDC. Contingency – Risk and uncertainty is captured in the project cost estimate as contingency. Contingency amounts are revised with each new cost estimate over the project’s life cycle as the risks are revealed and uncertainty is reduced. Hence project cost estimate during plant feasibility stage has higher component of contingency as compared with the project cost estimates made during construction and commissioning stage.